The Benefit of Office Interventional Suites to the Complex and At-Risk CLI Patient. This year in the United States, approximately 160,000 to 180,000 of the estimated 18 million Americans with peripheral artery disease (PAD) will undergo amputation of a limb as a result of PAD-related complications. An unacceptable amputation rate of > 30% without any vascular evaluation persists, despite the education and attention given to critical limb ischemia (CLI).1 Epidemiologic studies have shown that there are differences in outcomes based on access to care and revascularization. Fortunately, the treatment of CLI with revascularization is becoming more widespread, and the interest in comprehensive team-based limb preservation programs is growing. This parallels the marked growth of office interventional suites (OISs) throughout the country. These OISs (also known as office-based labs) can often provide treatment for CLI in a more time- and cost-efficient manner while maintaining safety outcomes on par with patients treated in the hospital setting.2 Endovascular revascularization in OISs can help bring safe, effective, and appropriate therapies to a complex and at-risk CLI patient while improving access to care. Improvements in technology have allowed for the migration of revascularization services from the hospital setting to same-day interventions in the office setting. Care in community-based, freestanding office facilities focuses on providing endovascular revascularization with minimally invasive techniques and offers a cost-efficient, patient-preferred alternative site of care for patients. In many cases, these freestanding office-based vascular care centers are located in geographically convenient areas and offer reduced wait times for treatment, making quality vascular care more accessible for patients in need. The accessibility of care in the community setting is also vital to addressing racial, geographic, and socioeconomic disparities that exist among the PAD patient population. For example, PAD is more common in African Americans than any other racial or ethnic group because conditions that increase the risk for developing PAD (eg, diabetes, high blood pressure) are more common among African Americans.5 Data also show patients from a minority group are much less likely to receive preventive and therapeutic vascular screening and procedures.6 Among PAD patients specifically, minorities are less likely to have limb-sparing procedures, such as angioplasty and lower extremity bypass, and more likely to undergo amputation.7 In addition to these disparities in care, there is still an unacceptably high rate of amputations among all patients with CLI. Leaders from the vascular care community, including care providers, physicians, patient advocates, and manufacturers, have come together to form the CardioVascular Coalition (CVC) to advance community-based solutions designed to improve awareness, prevention, and intervention of vascular disease with a primary focus on PAD and amputation prevention. In conjunction with the CVC, the Outpatient Endovascular and Interventional Society (OEIS) is developing policies designed to reduce lower-limb amputations by ensuring patients receive arterial testing and therapy, if indicated, in advance of nontraumatic, nonemergent amputations. Together, we must all do more by working to strengthen limb preservation efforts in the United States. The complex nature of CLI dictates that patients with CLI are typically the most demanding, time-consuming, and resource-intensive cases. Many of these patients are not only very sick, but also require treatment in an expeditious fashion. Many are elderly and have diabetes and advanced or end-stage renal disease, which means coordination of care is essential. Care coordination can often be more expeditiously achieved in the outpatient setting than in a large, complex, often fractionated hospital environment. Some of the basic differences between the two approaches based on our experience are presented. In an OIS that focuses on the treatment of patients with CLI, resources will be devoted toward the streamlined treatment of patients. If the physician in an OIS setting decides that a patient requires urgent treatment, she/he will simply make that determination, and the patient receives prompt and timely therapy. In many hospitals, the patient is often at the mercy of a scheduler who has many impediments and often little to no incentive to facilitate this coordination. Additionally, the hospital staff has the challenge of accommodating the needs of multiple physicians, groups, and specialties. There has been a perception that operators in an OIS “cherry-pick” straightforward cases from the hospital when, in fact, the situation in most OISs is exactly the opposite. To perform very complex cases, new and innovative technology is often needed. Our experience is that it is often much easier to obtain new devices and offer an array of needed technologies in an OIS than in a hospital, particularly when the hospital is part of a larger system. Many experienced operators in the OIS setting are more comfortable treating a complex patient in the office because of the availability of experienced and dedicated staff. A diabetic patient with CLI undergoing dialysis 3 days per week is seen on Monday afternoon. He has a significant ulceration with some necrotic tissue on his foot that needs debridement by his podiatrist as soon as possible with upfront revascularization. The patient wants his case to be done on Tuesday or Thursday to avoid his dialysis days and wants a morning-only time slot because of his diabetes. The patient receives the same endovascular therapy with the same devices performed by the same operator as he would have had in the hospital, but in a more timely fashion. In the end, the focus of care in the OIS is that the patient receives the right care, at the right time, in the right place, by the right provider—a true demonstration of the role of the OIS in CLI. The transition from hospital- to office-based endovascular care requires coordination and planning. From diagnosis to discharge and follow-up, the organization must function in a patient-centered manner to achieve the best outcomes for the patients. The OIS must be appropriately equipped and the operators and staff adequately trained and prepared for all possible situations and outcomes. This means an “all-in” commitment from the highest level toward building a successful OIS. Imaging equipment needs to meet certain standards and must have digital subtraction ability to be able to perform high-quality CLI interventions. Patient safety and achieving successful outcomes must be the primary drivers for selection of equipment. An investment into the development of vascular sonographic capability is highly recommended, if not essential. More advanced labs in the OIS report 100% usage of ultrasound-guided access for femoral or alternative access locations (ie, pedal, transtibial, etc). To borrow from a well-known quote, “It takes a village” to build a successful office-based CLI program, and this begins with education and training. First and foremost, the physician operators should have experience, training, and credentialing to perform these complex CLI procedures as well as skill sets for bailout of potential complications. Support from the entire organization is essential to providing the timely and comprehensive care required by the patients. Cardiovascular technologists must become adept in using the multitude of devices and techniques employed to treat CLI, and these competencies are often easier to attain and maintain in the OIS. All staff must be certified in advanced cardiovascular life support and trained to watch for and manage signs of access site- or procedure-related complications and to initiate emergency protocols. Practice-wide education (ie, midlevel practitioners, schedulers, etc) must be conducted to ensure that staff fully appreciates the importance of expedited access for the CLI patients. The importance of educating other community physicians, podiatrists, and other health care providers to deliver coordinated CLI care is also essential. The care continuum does not stop when the patient gets out of bed following the procedure. Detailed discharge instructions must be provided to the patient and his/her support person. Follow-up calls are essential, and a quick and easy path to postcare evaluation must be available for any issue that may need attention. Consideration should also be given to enrolling CLI patients into a chronic care management program or other coordinated care program to ensure appropriate and timely extended care. Finally, to ensure that appropriate and quality care is given, a quality review program (such as recommended by the OEIS) must be initiated, watching for trends or concerns and promptly responding to any red flags. OEIS was formed in August 2013 by a multidisciplinary group of physicians who shared an interest in performing procedures in an OIS. These physicians were equally represented by vascular surgery, interventional cardiology, and interventional radiology specialties. It is a unique medical society in that these frequently competitive specialties work together to promote education and improvement of care in the OIS. There are many advantages to this health care delivery model, including more control of procedure scheduling, markedly improved physician efficiency, improved patient and physician satisfaction, a less stressful and confusing environment for the patient, physician ability to control quality, and the potential to save the health care system money. The OEIS is very interested in promoting high-quality, ethical, and cost-effective care. The society’s six quality initiatives include promotion of safety, credentialing of optimally trained operators, measuring outcomes, ensuring compliance with state and federal regulations and coding, procedure and patient selection appropriateness, and peer review (Table 1). 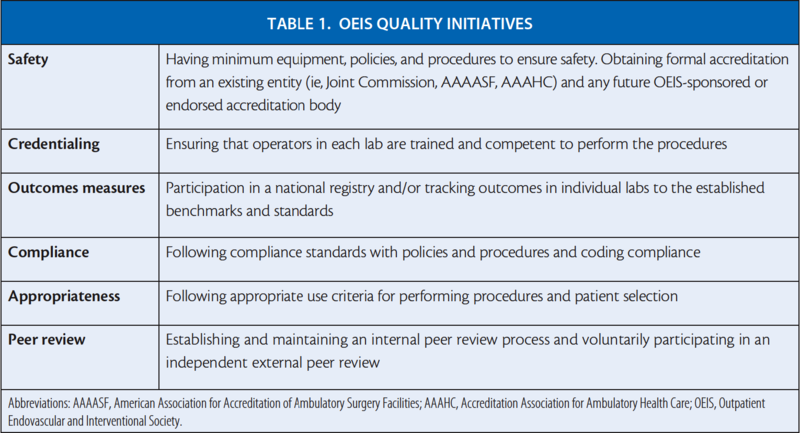 Future goals for the OEIS include an organized national registry to collect data and participation in an existing or new accreditation pathway for all office interventional procedures to help further the quality and standards in the OIS. Enhanced by the continued work of professional organizations and refinement of measurement tools, endovascular physicians are using the OIS as a unique site of service to help address the growing epidemic of CLI. OISs help bring safe, effective, and appropriate therapies to the complex and at-risk CLI patient and provide an option to improve a high-quality access to care to this underserved population. For more information about the OEIS, please visit www.oeisociety.org, and for more information about the CVC, please visit www.cardiovascularcoalition.com. 1. Vemulapalli S, Greiner MA, Jones WS, et al. Peripheral arterial testing before lower extremity amputation among Medicare beneficiaries, 2000 to 2010. Circ Cardiovasc Qual Outcomes. 2014;7:142-150. 2. Mesbah Oskui P, Kloner RA, Burstein S, et al. The safety and efficacy of peripheral vascular procedures performed in the outpatient setting. J Invasive Cardiol. 2015;27:243-249. 3. Sanguily J. Endovascular evaluation and treatment of PAD patients results in lower amputation rate. Poster presented at: International Symposium of Endovascular Therapy 2015; February 3, 2015. Hollywood, Florida. 4. Goodney P, Tarulli M, Faerber A, et al. Fifteen-year trends in lower limb amputation, revascularization, and preventive measures among Medicare patients. JAMA Surg. 2015;150:84-86. 5. National Heart, Lung, and Blood Institute. Facts about peripheral arterial disease (PAD) for African Americans. Bethesda (MD): US Dept of Health and Human Services; 2006. NIH publication 06-5835. 6. Brothers TE, Robison JG, Sutherland SE, Elliott BM. Racial differences in operation for peripheral vascular disease: results of a population-based study. Cardiovasc Surg. 1997;5:26-31. 7. Lefebvre K, Lavery L. Disparities in amputations in minorities. Clin Orthop Relat Res. 2011;469:1941-1950. The Society for Vascular Surgery, the American Podiatric Medical Association and the Society for Vascular Medicine collaboratively have published their first-ever set of clinical practice guidelines for treating the diabetic foot. If you have diabetes, you're much more likely to have PAD, but you can cut your chances of having those problems by taking special care of your blood vessels. Your risk for wounds on your feet leading to amputation increases the longer you have diabetes. Proper foot care is important for the rest of your life. • Nerve damage leads to neuropathy and the loss of feeling; wounds on your feet can easily go unnoticed. If not treated immediately, a small wound can progress to a bigger wound. • Decreased circulation makes your skin and tissue weaker. This means wounds can form more easily and be slow to heal. • Joint and bone abnormalities can deform the foot and make certain areas more likely to form wounds. Pressure on your feet from ill-fitting shoes can contribute to these deformities. • Wash your feet daily with mild soap. Dry your feet gently; do not rub too vigorously. • Apply lotion to avoid dry or cracked skin. • Trim toenails when wet because that’s when they are softer. Trim nails straight across. Do not trim your skin or cuticles. If you have trouble, you may want to see a podiatrist. • Check your feet every day at the same time—make it part of your daily routine. Look carefully for wounds on the top and bottom of each foot, all of your toes (top, bottom and tip) and between your toes. If you can’t see all parts of your feet, use a mirror or ask someone to inspect them for you. • Skin between toes can easily crack and wounds can be overlooked. Make sure to pull apart your toes and look carefully. • Be sure to check the ball of each foot; it is subject to a lot of pressure and is a common area for calluses and wounds to develop. • If you notice any cuts, scrapes, areas of discoloration, or calluses on your feet, notify your health care provider immediately. • Trust your instincts. If either foot, or part of either foot, feels different in any way, let your health provider know. • Your shoes should be comfortable and not cause any increased pressure on any bony areas. • If you have noticed any deformities in your feet, you may want to see a podiatrist for help in choosing proper footwear. • Avoid extreme heat of any kind: do not soak feet in hot water, do not use hot water bottles or heating pads/blankets. • Never walk barefoot anywhere. With proper foot care, you can avoid wounds, infections and foot or leg amputation. Thomas is a retired Registered Nurse who enjoys living an active lifestyle. He plays 18 holes of golf regularly, is an avid fisherman, loves to travel, enjoys taking his dog for long walks, and he and his wife love to stroll the malls spending time together. His active lifestyle was disrupted when he began experiencing aching, painful and tired legs while walking. He could barely walk 1 block before he needed to stop due to the discomfort in his legs. Thomas was no longer able to engage in the active things in life that he enjoyed most. He thought this might be a sign of getting older. After 1 year of living with pain that was getting progressively worse, Thomas decided it was time to seek medical advice. He first consulted with his primary care physician who suggested he could have a blockage in an artery in his right leg and referred him to Dr. William Julien, a board certified, expert endovascular surgeon who specializes in treating patients with arterial and vascular diseases. Upon examination and testing, it was determined that Thomas had a blockage in the arteries in his right leg and a partial blockage in the left leg. He was diagnosed with peripheral artery disease (PAD), a disease of the arteries that is caused by a thickening of the inside walls of the arteries of the legs. This thickening (plaque), called atherosclerosis, narrows the space through which blood can flow, decreasing the supply of oxygen and nutrients to the legs and feet. It can affect both legs, but most often symptoms begin in one leg. PAD is very common affecting over 10 million Americans over the age of 55. Symptoms of PAD are aching, painful legs while walking, but the pain typically subsides when a person stops the activity. Dr. Julien recommended that Thomas undergo go a minimally invasive procedure, balloon angioplasty used to open blocked and narrowed arteries in the leg to re-establish normal blood flow. He would need 2 separate procedures, 1 for the right leg and 1 for the left leg after the right leg healed. The procedure requires using imaging for guidance while a catheter is inserted through the femoral artery in the groin to the blocked artery in the legs. Once the catheter reaches the blocked artery, the balloon is inflated to open the blood vessel where it is narrowed or blocked. In Thomas’ case, he needed to have a stent, a small metal-mesh tube, inserted to keep the artery open after the angioplasty. Angioplasty replaces invasive surgery and all it requires is a nick in the skin the size of a pencil tip where the catheter enters the groin. The angioplasty to the right leg was performed in January of 2015 and was very successful. The second angioplasty on the left leg was performed 2 months later in March of 2015. Within 2 weeks post-surgery, Thomas was back on his feet enjoying his active lifestyle once again. “I can now enjoy walking the mall with my wife, take my dogs for walks, go on fishing trips, travel, golf and feel comfortable walking distances pain free”, says Thomas. What a relief! Fast forward to July 2015… Thomas was feeling great, in fact he says he could use his “new legs” for anything he wanted to do and was also able to walk further distances. Thomas loves to fish and went on a fishing trip but unfortunately, he took a bad fall on the boat that fractured his right ankle and crushed the tissue on his left shin down to the muscle. He had 3 orthopedic surgeries for the ankle but was left with an open wound on his left shin where the tissue was crushed. He tried many types of remedies to heal the wound but nothing seemed to work. He was in pain and had difficulty walking… once again. Fortunately, Thomas had a follow-up appointment scheduled with Dr. Julien for his angioplasty procedures. He showed his wound to Dr. Julien who is an expert in the treatment of open wounds to the lower extremities. Non-healing, open wounds in the legs are often a result of advanced peripheral artery disease (critical limb ischemia) because plague build-up in the arteries reduces blood flow to the legs and without blood oxygen and nutrients, wounds cannot heal properly. Critical limb ischemia is a serious condition that requires immediate treatment to re-establish blood-flow to the affected area. If not treated quickly, a limb amputation may be needed. Since the wound was on the left leg that had been previously treated for plaque build-up, Dr. Julien suspected that the artery had additional plaque build-up and scheduled Thomas for an angiogram, a special X-ray that can detect blockages in the arteries. Sure enough, Thomas had plaque build-up, atherosclerosis, in the left leg that was preventing the wound from healing. This time Dr. Julien performed atherectomy, a procedure that uses a small drill to shave the plaque from the arteries. Once the plaque was removed, a balloon angioplasty was performed to keep the artery open and re-establish normal blood flow. Three weeks later, Thomas’ wound was completely healed and closed. “I can’t say enough about the wonderful care I received at South Florida Vascular Associates”, says Thomas. Dr. Julien is a great doctor who makes me feel very comfortable and he has a great sense of humor! The staff is terrific, very informative and they explained everything to me every step of the way. I love that they have an in-office, operating suite and recovery area which made the process so much easier and more convenient. “I feel so much better, I’m not in any pain, I can walk again and I even went out recently to play my first round of golf in over 1 year”. “I am so grateful and appreciative for the outstanding care that was given to me, I am now returning to the active man I once was!” said Thomas. If you or a loved one has colorectal cancer that has spread (metastasized) to the liver, it is important to learn the facts and evaluate treatment options. A diagnosis of colorectal liver metastases can be overwhelming, but there is hope. At South Florida Vascular Associates we offer a minimally invasive cancer treatment radioembolization using yttrium 90 (Y90) beads. This non-surgical treatment is most commonly used for advanced stage liver cancer (primary or metastatic). Y-90 beads are used in targeted radiation therapy, also known as selective internal radiation therapy (SIRT) that selectively delivers a dose of internal radiation to liver tumors. Due to the liver tumor's unique blood supply, millions of tiny spheres are delivered directly to the tumors while sparing healthy liver tissue. The treatment requires a small incision in the groin and is administered via a very small flexible tube (microcatheter) into the liver. As a mother of five, Heather Bishop knows how to take on anything that life throws her way. However, on August 7, 2014, Heather learned of a new challenge she would have to face: stage IV colon cancer. Earlier in 2014 Heather noticed that many of the symptoms she was experiencing were closely associated to Irritable Bowel Syndrome, so she decided to schedule a doctor’s appointment. She explained to the doctor how she was feeling and what symptoms she noticed. While the doctor took note of these symptoms, he noticed a hard area under Heather’s rib cage. This area made it difficult for Heather to sit up straight, but she didn’t feel any pain. A CT scan was scheduled immediately and shortly thereafter a colonoscopy. Heather soon learned that she had a tumor in her colon. Her liver was covered and the tumors had metastasized to her spine, skull, and hip. The doctor acknowledged that it was possible she could also have tumors in her lungs, but unfortunately the tumors were too small to conduct a biopsy. At the end of August, Heather started chemotherapy. Although she was going through chemotherapy, the amount of cancer discovered in Heather’s liver concerned her doctor. He recommended she look into Selective Internal Radiation Therapy (SIRT). After consulting another doctor that had experience using SIR-Spheres® Y-90 resin microspheres, the doctors agreed that Heather was a great candidate. During off weeks of chemotherapy, Heather went in for her SIRT treatment. If she was more fatigued than normal, she didn’t notice. Out of all of the procedures and treatments, Heather believed that the SIR-Spheres Y-90 resin microspheres interrupted her life the least. She didn’t notice pain or discomfort. Instead, she felt remarkably better. Side effects of SIRT are generally mild, including tiredness, loss of appetite, mild fever, stomach pain, sickness, injection site soreness and diarrhea. There is no hair loss with this treatment. Most side effects following a SIRT procedure are minor, but a small number can be serious. Every patient is different in how he or she reacts to a treatment. In late November Heather had her last procedure. Her father came to help with her five children as she recovered. By mid-December, Heather felt well enough to take care of her family. She still had help with meals and household responsibilities, but for the most part Heather could take care of herself and her children and even went on vacation. At her final follow up appointment, Heather’s doctor was so surprised by the massive change to her liver that he called in his nurse practitioner to see her, too. The doctor said he hadn’t seen results like that in five years. When Heather found out about her stage IV colon cancer she was told that her colon wouldn’t kill her, but her liver probably would. Today, Heather believes that without SIR-Spheres Y-90 resin microspheres, her life would be dramatically different. Now, Heather shares her inspiring story with others in the hopes that they, too, can benefit from SIRT and have a greater chance of living a longer, healthier, and more productive life. Are You at Risk for Peripheral Artery Disease? Is It Preventable? Peripheral artery disease (PAD) is a disease in which plaque, the accumulation of fat and cholesterol, builds up in the arteries that carry blood to your head, organs, and limbs. This build of plaque is a condition called atherosclerosis. Over time, plaque can harden and narrow the arteries limiting the flow of oxygen-rich blood to your organs and other parts of your body. If the plaque build-up is not addressed, you could potentially lose a limb. By taking action to control your risk factors such as being physically active, following a healthy diet rich in fruits and vegetables and quit smoking, you can help prevent or delay PAD and its complications. Lifestyle changes can also help prevent and control conditions associated with PAD, such as coronary heart disease, diabetes, high blood pressure, high blood cholesterol and stroke. Although PAD can be serious, it's treatable. If you have been diagnosed with PAD, there are medications and minimally invasive, endovascular procedures such as atherectomy that can break up the plague in your arteries and re-establish normal blood flow through your legs. PAD treatment often slows or stops the progression of the disease and reduce the risk of complications. PAD affects over 10 million Americans, it is slightly more common in men than women and affects 12-20 percent of people 65 and older. By understanding your risks, changing your lifestyle to a healthier one and quit smoking if you smoke, you can hopefully lower and prevent your chances of developing PAD. 39 year old Gabriel Quiroga is an air conditioner contractor. Part of his everyday routine is going house- to -house or business- to -business, where he climbs up ladders get up to roofs, into attics, and other hard to reach areas. Quiroga is totally dependent upon the use of his legs for his livelihood and a good quality of life. Quiroga was experiencing severe pain in his left leg and swelling at the ankle, especially while standing and climbing up ladders. “I was in constant discomfort and was concerned that I might have to change careers. I could barely stand for any length of time without feeling severe pain”, said Quiroga. Quiroga was referred to South Florida Vascular Associates and Dr. William Julien to discuss his symptoms and determine a treatment option. Upon testing and examination, Dr. Julien determined that Quiroga had a large varicose vein in his left leg which was causing venous insufficiency, a common condition resulting from decreased blood flow from the leg veins up to the heart. “When valves become weak and don't close properly, they force blood to flow backward, a condition called reflux”, said Dr. Julien. In normal veins, valves in the vein keep blood moving forward toward the heart. With varicose veins, the valves do not function properly, allowing blood to remain or pool, in the vein. Pooling of blood in a vein causes it to enlarge, which creates pain, especially when a person is standing and placing pressure on the leg. Varicose vein treatment, also known as endovenous laser treatment (EVLT), is a minimally invasive procedure that uses radiofrequency or laser energy to seal off and close varicose veins in the legs. It may be used for cosmetic purposes, but it is most commonly used to help alleviate related symptoms such as aching, swelling, skin irritation, discoloration or inflammation. EVLT is safe, less invasive than conventional surgery known as vein stripping and leaves virtually no scars. EVLT is an alternative to traditional open surgery and it requires minimal access to the vein. In the past, if a patient was suffering from painful varicose veins they would need to undergo an open surgical procedure (vein stripping) to seal off the vein. Vein stripping is very painful and a difficult experience for the patient. Vein stripping is done using general anesthesia and the procedure usually takes up to 1 1/2 hours. After surgery patients have bandages and compression stockings on their leg and the leg may need to be wrapped to control swelling and bleeding for 3 - 5 days or longer after surgery. EVLT on the other hand, is a much easier on the patient. The procedure typically takes less than one hour, provides immediate relief, no general anesthesia, recovery period is minimized and a patient can immediately return to normal activities, without scarring or stitches. There is a lower rate of complication and a higher success rate. “I can’t believe how simple this procedure was”, said Quiroga. “I postponed having the procedure for so long thinking I would be out of work for several weeks and the day after the procedure, I was able to climb my ladder, something I thought I might never be able to do again”. Aside for wearing a compression stocking for a few weeks, Quiroga did not experience any discomfort and was immediately able to return to his job. “This procedure is amazing, said Quiroga, I can’t believe how easy and painless it was”. February 5 is the day that the American Heart Association asks everyone to wear red in order to raise awareness for heart disease in women. Created in 2004, Go RED day was designed to promote healthier lives for women of all ages. Today 1 in 3 women are affected by heart disease in the United States, and nearly 44 million American women are living with heart disease. Even though cardiovascular disease is quite prevalent in women, only 1 in 5 women are aware that heart disease is their greatest health risk. While we have made great strides in reducing cardiovascular death rates in women over the last 20 years, we still must continue to educate and advocate for women of all ages—this advocacy begins with dispelling the common myths surrounding heart disease in general. It is my hope that through efforts such as the Go Red campaign, we can promote better heart health for millions of American women. Ultimately, we must engage women and their families in order to most effectively eliminate needless cardiac related deaths in the next decade. The truth: More women than men die of heart disease every single year. Heart disease kills more women than all types of cancer combined. While most women believe that their greatest health risk comes from breast or uterine cancer—in actuality, a woman’s greatest health risk is from heart disease and stroke. Nearly 90 percent of all women have at least one risk factor for heart disease. The truth: Heart disease affects men and women differently. Biologic and hormonal differences in men and women contribute to the ways in which heart disease develops and progresses. Studies have shown that after menopause, women have an even higher risk for heart disease—estrogens seem to promote better cholesterol profiles. Women tend to present to a healthcare provider far later in the course of the disease and have more diffuse blockages in their heart (coronary) arteries. These blockages in coronary arteries result in heart attacks. Heart attacks have several commonly recognized symptoms. Men tend to have more typical symptoms like crushing chest pain and associated shortness of breath, nausea, radiation of pain to neck or jaw. Women, in contrast, may have very atypical symptoms and some women have no symptoms at all. 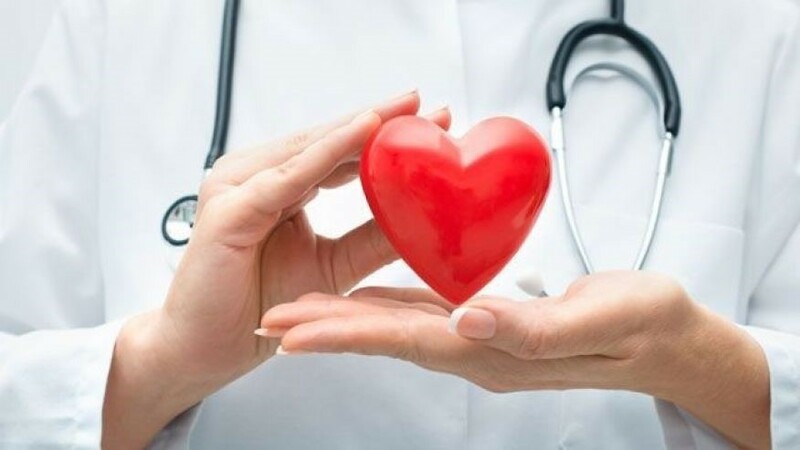 According to the Centers for Disease Control and Prevention (CDC), nearly two-thirds of women who have sudden cardiac death due to heart disease have no symptoms. While women may certainly have the same symptoms as men, it is more common for them to present with more vague and non-specific symptoms such as feelings of dread, anxiety, back pain and flu-like symptoms. Heart attacks appear to be much more severe and carry a higher risk for death and complications in women as compared to men. For example, in the first year following a heart attack women are 40 percent more likely to die than men. In the six years following a heart attack, women are twice as likely to have a second event as compared to men with similar disease. The truth: Women with heart disease are under-treated and underserved. Women are not screened for and diagnosed with heart disease as aggressively as men. Many times women are sent home from the hospital with atypical symptoms only to find out later that they had suffered a heart attack. When women are diagnosed with heart disease, they are less likely to be treated with the most advanced and aggressive therapies. Men are more likely to undergo cardiac catheterization or coronary artery bypass operations to restore blood flow to the heart after a blockage occurs. Women are more likely to have both minor and major complications from invasive procedures but, in many cases, women seem to see a greater benefit as compared to men. After suffering a heart attack and being treated in the hospital, women are far less likely to be referred for cardiac rehabilitation and are also less likely to be placed on important medications that have been shown to prevent future events. Nearly 80 percent of all women have at least one risk factor for heart disease. More importantly, many of these risk factors are modifiable. While breast cancer affects 1 in 8 women, heart disease affects one in three. Chronic heart disease and suffering a heart attack can result in physical limitation, significant decrease in quality of life, depression and ultimately heart failure. SO, WHAT CAN WOMEN DO? Women must take control of their own health.